Audio transcription is utilized across a wide-variety of industries. Whether you’re looking for legal, medical, academic, media, or financial transcription, it’s important to find the best online transcription service provider that can complete the work quickly, accurately, and within budget. As you search for the right company, be sure to determine your priorities. If you’re like most businesses, you need an audio transcription company that provides a quick turnaround time, accurate work, transparent pricing policies, and appropriate security measures to keep your files safe. Here are four questions to ask yourself when determining which audio transcription service is best for your business. 1) How fast will I receive my transcript? Turnaround time can vary greatly between audio transcription services, from a couple hours up to multiple weeks. If you’re in a crunch and need your audio transcription files delivered within 24 hours, you’ll find that nearly all providers charge rush delivery fees. These fees can range anywhere from $1.50-$3.00 per minute of audio. Rev’s turnaround time: To keep things simple, Rev does not charge rush delivery fees. While turnaro­­und times vary by order size, we generally return audio or video transcriptions within 6 hours for 30-minute files, making us one of the fastest (if not the fastest), audio transcription service companies around. Below is a graphic showing our average delivery time based on file length. If you’ve ever used speech-to-text apps, you’ve probably noticed the accuracy isn’t great. The quality gets even worse when you have background noise, multiple speakers, or accents in your audio. To get the most accurate transcripts, it’s important to find a service provider that uses people, rather than software, to do the transcription work. Many of the low-cost transcription agencies use software which is reflected in the quality of their work. 2) What level of accuracy do you guarantee? If you’ve ever used speech-to-text apps, you’ve probably noticed the accuracy isn’t great. The quality gets even worse when you have background noise, multiple speakers, or accents in your audio. To get the most accurate transcripts, it’s important to find a service provider that uses people, rather than software, to do the audio transcription work. Many of the low-cost audio transcription agencies use software which is reflected in the quality of their work. Rev’s Accuracy: Rev is able to offer 99% accuracy or better, among the highest rates in the industry, by hiring the most talented transcriptionists to join our team. We also use a system of quality checks and client feedback on each project, ensuring only the best transcriptionists stay in our network and our clients receive high-quality transcripts. 3) Are there any hidden fees for the audio transcription? Advertised price vs. the actual price for transcription work can be two very different things. A company may advertise that their rates are $.79/minute, but once you add in all their extra fees, you’ll pay much more than that. It’s very similar to how discount airlines operate. The three standard fees that nearly all audio transcription companies charge are priced per audio minute, verbatim fees (include filler words (um, ah), nonverbal communication, and false starts) and timestamps. Where the fees really start to add up is when you get nickel and dimed for having more than one speaker, accents, technical content and when you need faster delivery. These fees can increase your total audio transcription price by 300-400%! Rev’s pricing: Rev is committed to keeping transcription pricing as simple as possible. We charge $1 per minute of audio and have options for verbatim and timestamps at $.25/min each. Our rates are among the lowest you’ll find when you search for an audio transcription service. 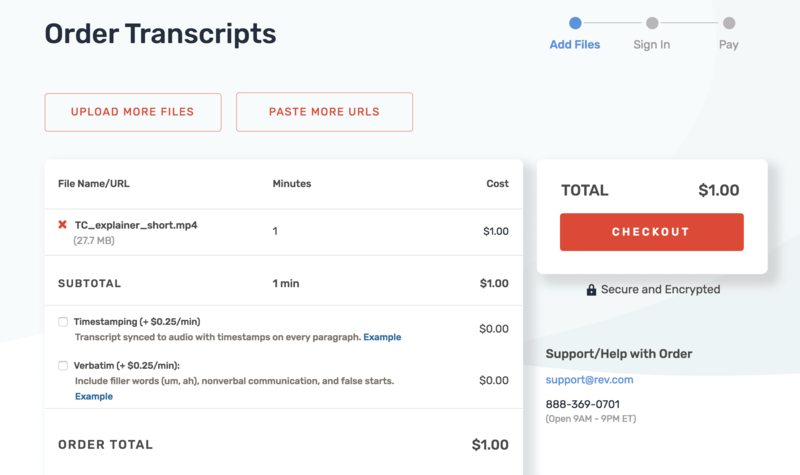 To see what it will cost to transcribe your audio files, simply upload them on our site and you’ll get an instant price as seen in the image below. 4) How secure are my files? Rev has received millions of minutes of audio and video files to transcribe over the years. Many of these files contain sensitive content such as medical records, conversations with law enforcement and lawyers, and business meetings containing company financials and proprietary information. It’s important to find an audio transcription service provider that takes maximum precautions to ensure the security of your documents. Rev’s security: Files are securely stored and transmitted using TLS 1.2 encryption, the highest level of security available. We never share client files or personal information with anyone outside of Rev. Files are visible only to the professionals who have signed strict confidentiality agreements. We also delete files upon request from our clients. When you’re ready to hire the best audio transcription service to transcribe audio to text, contact Rev.